March 20, 2018 - While on location for the Montreal Wood Convention, Canadian Forest Industries received an exclusive opportunity to join a group of foreign buyers on a study tour to two Quebec sawmills. C.A. SPENCER Inc.’s Scierie Carrière Ltée is a hardwood specialty mill in Lachute where CFI experienced the second tour of the day. Scierie Carrière is one of two sites owned by C.A. SPENCER. The second is Bois Hunting Inc. in Waterville, Que. 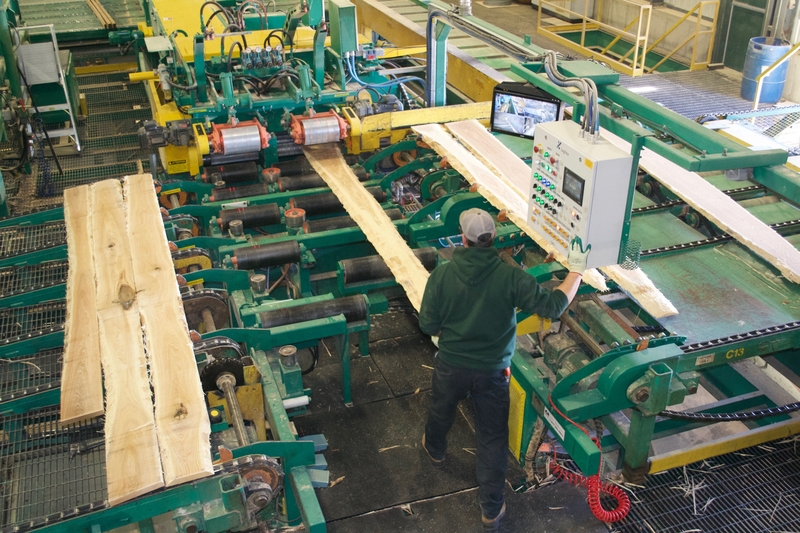 Together, the two mills produce 30 million board feet of lumber a year, which altogether comes down to approximately 60,000 board feet of lumber produced in a day, and about 7,000 board feet produced in an hour. “Both mills each run a 20-hour day and night shift” among its more than 150 employees explained Max Cadrin, sales and marketing representative. The mills works with varying lumber thicknesses ranging from 4/4 (1”) thru 12/4 (3”). Following the debarking process (which the tour members could not see due to safety measures), the lumber undergoes a metal detector to ensure no metal pieces are in the wood. “With hardwoods, the good quality wood is found within the exterior part of the log,” operations manager Michel Ferron explained. Following this process, 2x3 and 4x4 cants are made. At Scierie Carrière, roughly 50 per cent of the total production is hard maple. Other main species are yellow birch, soft maple, red oak and basswood. “There are six kilns here in Lachute with approximately 500,000 board feet per charge for the kiln capacity” Ferron explained. “Red oak for instance [which was being dried on site the day of our visit], takes roughly 35-45 days to dry depending on thickess,” he said. C.A. SPENCER was founded in 1908, celebrating its 110th year in business in 2018 and spans five generations to this day. To get a peek at the first mill tour of the day, click here. Catch up on the action with CFI’s live coverage of the 2018 Montreal Wood Convention on Twitter @CFIMag. And read our full coverage of the event here.